This is a pack of virtual tools that will allow you to create your own music sessions as if you were a professional DJ. 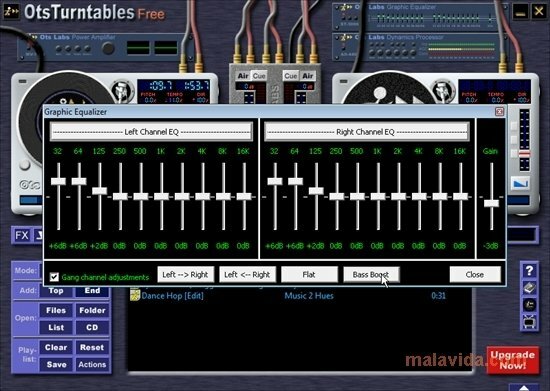 The software will allow you to use the scratch technique, adjust the tempo and pitch of the music, and is compatible with the main audio formats that currently exist, like MP3, OTS (this software's own format) and WAV. The application has various audio effects that you will be able to apply to your tracks. Its two turntables will allow you to control the music in real-time, guaranteeing a sensation that is similar to that produced by physical turntables. What's more, it includes Ots MP3 Convertor and Ots Studio, a couple of tools that allow you to convert between formats with the objective of making all your music library compatible with the software. The possibility to create playback lists allows you to get away from always having to pay attention to the mixes, thus being able to program a full list of tracks to be played in order. The sound output has a dynamic compressor that will allow you to adjust the sound quality to obtain a better performance and volume. You will also have an equalizer available, that will allow you to adjust the distribution of the frequencies of your music to improve the audio quality or to carry out sweep effects. The program includes a specialized tool that will allow you to create mixes automatically. What's more, the mixing table included in the interface has a crossfade and independent volume control, with the possibility to establish a keyboard shortcut for any of these controls. A complete mixing software application that you should try if the music world appeals to you. OtsTurntables can be the start of a career of success at the DJ table. Download it now and start practicing! This software is free for personal use only.